UPDATE 7/3/14: The Boston Pops Fireworks Display has been moved from 7/4/14 to 7/3/14 due to impending weather. More info can be found here. Please make sure to do your due diligence to check if any additional events have been canceled on Friday. 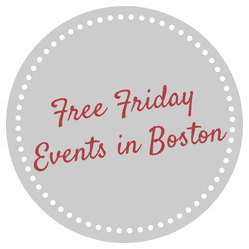 Every Friday this summer, there will be so many free and fun events happening in Boston and Massachusetts. Every Wednesday this summer I will do a roundup of events just for Friday! This Friday is a little more exciting since it is the Fourth of July and hopefully you will have it off! The Highland Street Foundation and Boston Harbor Hotel will still have their usual Friday events, so feel free to take advantage of those if you are looking for something fun and different to do on the Fourth of July. Also, keep in mind that the MBTA will be free after 9:30pm on Friday on Thursday night and will be extra busy. Free Fun Fridays take place every Friday with free admission to great attractions in Massachusetts thanks to the Highland Street Foundation. Let me know if there are any great Friday events that I missed in the comments below! Make sure to check out my 27 Free Things to Do in Boston, Free Fitness Events in Boston for Summer 2014, and The Complete Guide to Saving at Fenway Park if you are looking for more ways to save money this summer in Boston. Don’t forget to sign up for Boston on Budget’s nightly e-mail for suggestions right into your inbox! Hope you have a great Fourth of July!! !